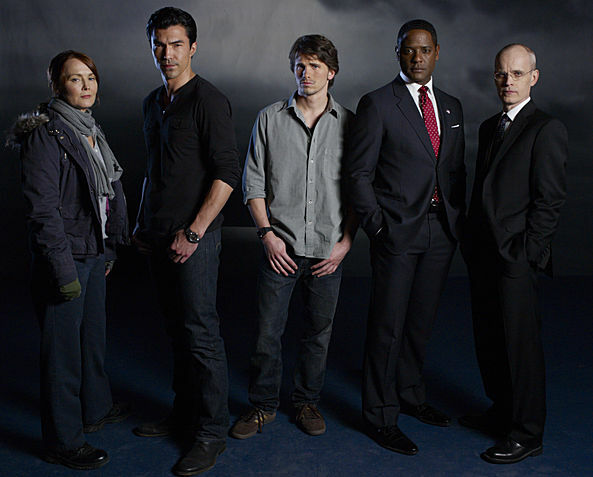 Laura Innes as Sophia Gavras, Ian Anthony Dale as Simon Lee, Jason Ritter as Sean Walker, Blair Underwood as President Martinez, and Zeljko Ivanek as Blake Sterling star in "The Event" on NBC. Premièring September 20, 2010, on NBC, "The Event" is an emotional, high-octane conspiracy thriller that follows Sean Walker (Jason Ritter), who investigates the mysterious disappearance of his would-be fiancée, Leila (Sarah Roemer, "Disturbia"), and unwittingly begins to expose the biggest cover-up in U.S. history. Sean's quest will send ripples through the lives of an eclectic band of strangers, including newly elected U.S. President Elias Martinez (Blair Underwood); Sophia Maguire (Laura Innes, "ER"), who is the leader of a mysterious group of detainees; and Leila's shadowy father (Scott Patterson). Their futures are on a collision course in a global conspiracy that could ultimately change the fate of mankind. Ian Anthony Dale ("Daybreak"), Clifton Collins, Jr., Taylor Cole, Lisa Vidal ("The Division"), Bill Smitrovich ("The Practice") and Emmy winner Željko Ivanek ("Damages") also star in the ensemble drama. For more information, see the official Web site at NBC.com.